Patience is all important in the appreciation of Vieux Télégraphe; it really is the archetype of a wine for the cellar. 2007 is nonetheless such a good vintage that the quality is manifestly evident even in youth. With distinct aromas of black cherry, earth (almost peat) and pepper, the wine transports one to the sensuous warmth of a relaxing Mediterranean afternoon. 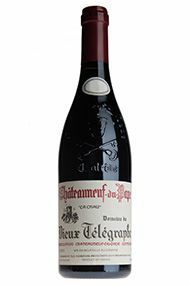 The Wine Advocate - The 2007 Vieux Telegraphe may be the greatest wine made at this property since the 2005 and 1998. Dense ruby/purple-tinged with an exquisite nose of salty sea breezes, licorice, ground pepper, jammy black cherries, black currants, figs, and plums, this is a full-bodied, rich, Provencal-styled offering with lots of sweet, ripe tannin. It is surprisingly accessible for a Vieux Telegraphe (this wine normally shuts down several years after bottling), but it should have great longevity (25+ years) given its power, full-bodied mouthfeel, and enormous length and richness. This is a brilliant effort from brothers Frederic and Daniel Brunier. 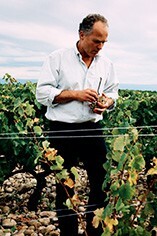 Parker - The 2007 Vieux Telegraphe Chateauneuf du Pape should ultimately eclipse the 2005 and 1998. It appears to be one of the finest wines made by Daniel Brunier and his brother. Its deep ruby color is accompanied by a superb nose of nori seaweed wrappers, licorice, pepper, tobacco leaf, and gobs of sweet black cherry and black currant fruit. Full-bodied with a fabulous texture, purity, and freshness (a consistent hallmark of this vintage), a juicy, rich, layered mouthfeel, and a finish that lasts for 45 seconds. Although young, the tannin, acidity, and alcohol are all well-integrated.I would wait until 2012 before pulling a cork on this one.